Could Kratos end up being the Norse god of war, Tyr? During last year's E3, Santa Monica Studios introduced us to an all new God of War with a 10-minute gameplay trailer (below starting at 5:22) featuring an aged Kratos and a young boy. The trailer showed us a bit of what we could expect from the game but did not reveal much of the story. This year’s E3 trailer for God of War was more like a typical cinematic trailer that gives us a glimpse of some of the story and additional characters. It also confirms what many had expected; that the boy is Kratos’ son. While there is a woman in the trailer, it is unclear if this woman is the kid’s mother or just an ally of Kratos. 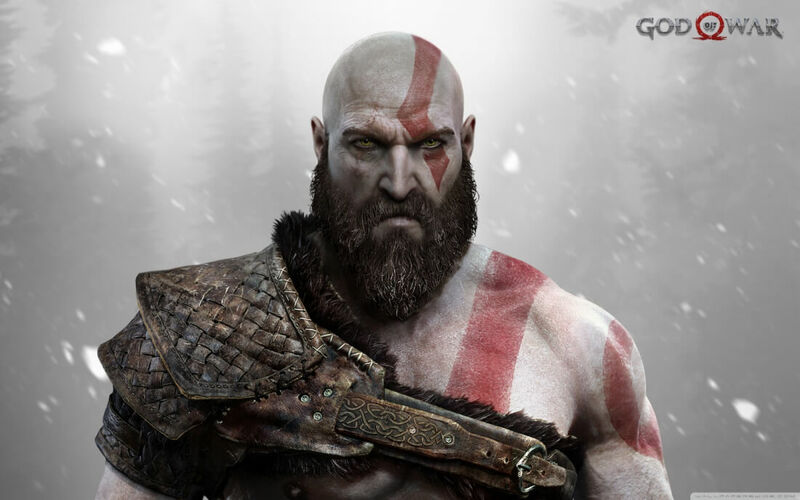 However, in the God of War: Behind the Curtain panel presentation, game director Cory Barlog mentioned that we would find out who the boy’s mother was as if it would be a surprise. So the woman in the trailer was probably not her. He also mentions that this "reimagining" of God of War departs from the last game, Ascension, in many ways, but more on that in a minute. The new trailer also revealed that the totally cool battle ax that always returns to Kratos’ hand from the first trailer is not the only weapon in his arsenal. God of War games have always had a variety of weapons to use and power up, but up until today we only knew of the ax. Gone are the supposedly eternally attached Blades of Chaos, replaced by an as-of-yet unnamed ax and shield. We were given hints in the 2016 trailer that the game was shifting from a Greek mythology theme to a Norse theme, as one of the enemies mentioned Valhalla. This seemed like a very peculiar reference back during E3 2016. How was it that Valhalla was being mentioned when Kratos ultimately replaced Ares as the God of War in Greek mythology? While the panel did not explain clearly what or how the shift in mythologies takes place, Barlog did give a brief description of the time frame of the game’s events (bottom), which sort of explains it. Norse mythology differs from Greek mythology in that all the Norse lore describes the gods as dead. Instead of living gods like in the Greek mythos, the Norse believed that the gods and giants had once lived on earth during a time called the "great migration," but were long dead. This movement occurred before the creation of the Norse mythos as people moved to the northern lands from Europe. According to Cory, this migration period is when the game takes place. He left the explanation pretty much at that, but you can assume that Kratos will encounter living gods such as Thor and Odin, and may even be revealed to be one of the Norse gods eventually. However, the team was tight-lipped when asked about what gods we could expect to encounter in the game. “Play the game” was all they would say. The gameplay looking fairly well polished even back in 2016, and production of the PlayStation exclusive is beginning to wind down now, but the title is still not due out until early 2018. This should be enough time to put the finishing touches on the game and start firing up the God of War hype train.